“Over the last century, we have already observed the disappearance of the Dion Islets penguin colony, close to the West Antarctic Peninsula,” says Stephanie Jenouvrier, WHOI biologist and lead author of the new study. “In 1948 and the 1970s, scientists recorded more than 150 breeding pairs there. By 1999, the population was down to just 20 pairs, and in 2009, it had vanished entirely.” Like in Terre Adélie, Jenouvrier thinks the decline of those penguins might be connected to a simultaneous decline in Antarctic sea ice due to warming temperatures in the region. Unlike other sea birds, Emperor penguins breed and raise their young almost exclusively on sea ice. If that ice breaks up and disappears early in the breeding season, massive breeding failure may occur, says Jenouvrier. “As it is, there’s a huge mortality rate just at the breeding stages, because only 50 percent of chicks survive to the end of the breeding season, and then only half of those fledglings survive until the next year,” she says. Disappearing sea ice may also affect the penguins’ food source. The birds feed primarily on fish, squid, and krill, a shrimplike animal, which in turn feeds on zooplankton and phytoplankton, tiny organisms that grow on the underside of the ice. If the ice goes, Jenouvrier says, so too will the plankton, causing a ripple effect through the food web that may starve the various species that penguins rely on as prey. 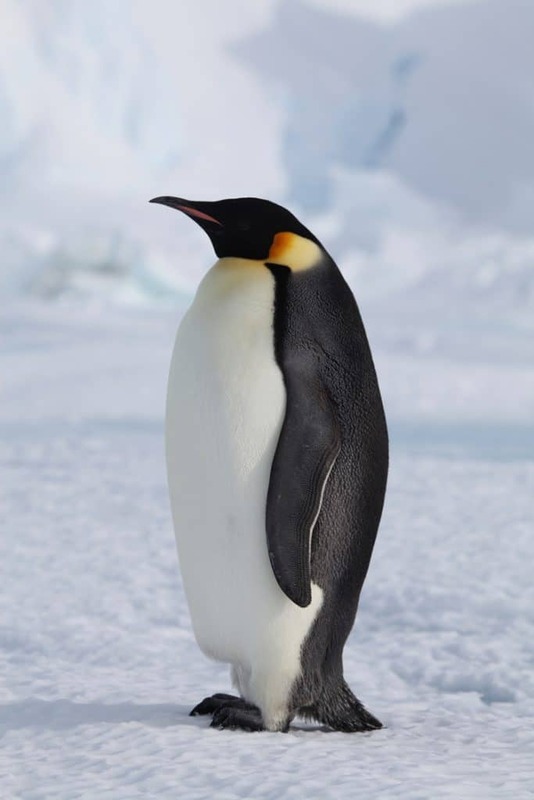 Jenouvrier used the output from these various climate models to determine how changes in temperature and sea ice might affect the Emperor penguin population at Terre Adélie. She found that if greenhouse gas emissions continue to rise at levels similar to today—causing temperatures to rise and Antarctic sea ice to shrink—penguin population numbers will diminish slowly until about 2040, after which they would decline at a much steeper rate as sea ice coverage drops below a usable threshold. “Our best projections show roughly 500 to 600 breeding pairs remaining by the year 2100. Today, the population size is around 3000 breeding pairs,” says Jenouvrier. Also collaborating on the study were Christophe Barbraud and Henri Weimerskirch of the Centre d’Etudes Biologiques de Chizé, in France, and Mark Serreze of the National Snow and Ice Data Center in the United States. Funding for the study was provided by the WHOI Ocean Life Institute, Arctic Research Initiative, and Access to the Sea, the National Science Foundation, REMIGE (Behavioral and demographic REsponses of Indian ocean Marine top predators to Global Environmental changes) program, Agence National de la Recherche Biodiversité, Zone Atelier de Receherches sur l’Environment Antarctique et Subantarctique, the Institut Paul Emilie Victor (IPEV), Alexander von Humboldt Foundation, Marie-Curie European fellowship, and the Cooperative Institute for Research in Environmental Sciences visiting fellowship. At nearly four feet tall, the Emperor penguin is Antarctica’s largest sea bird. Unlike other sea birds, Emperor penguins breed and raise their young almost exclusively on sea ice. 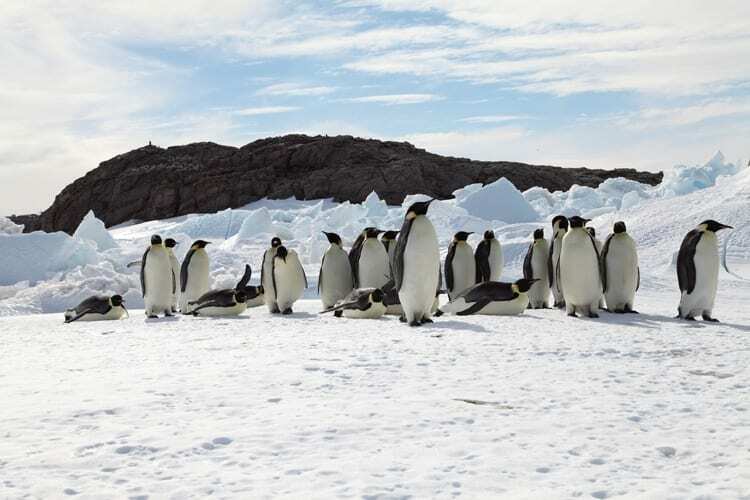 If global temperatures continue to rise, the Emperor penguins in Terre Adélie in East Antarctica may eventually disappear, according to a new study by led by researchers from the Woods Hole Oceanographic Institution. 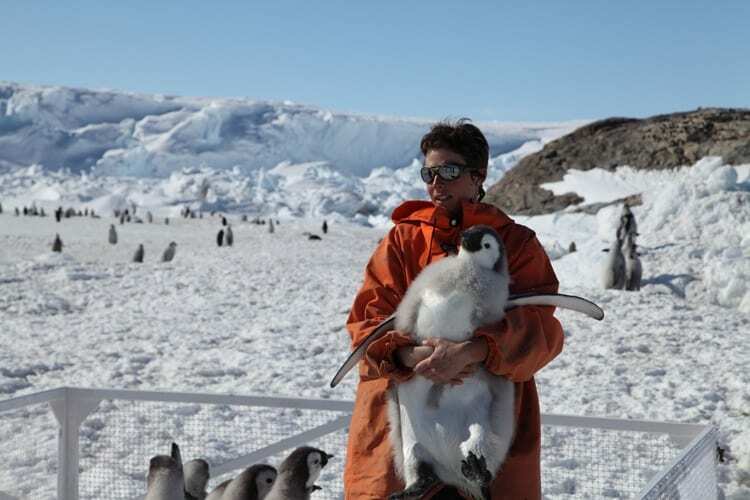 WHOI biologist Stephanie Jenouvrier readies an Emperor penguin chick (about five months old) for tagging during fieldwork in December 2011 in Terre Adélie. The research team utilized Passive Inductive Transponder (PIT) Tag technology, which helps identify the birds and track demographic data, such as whether they return to the colony to breed and raise chicks. A group of Emperor penguin adults make their way across sea ice in Terre Adélie in East Antarctica. In December, the adults return to the colony to provide food for the chicks. They can be observed walking in groups to the nearest open water areas where they feed. Disappearing sea ice may also affect the penguins’ food source. The birds feed primarily on fish, squid, and krill, a shrimp like animal, which in turn feeds on zooplankton and phytoplankton, tiny organisms that grow on the underside of the ice.